I just received the promotional material for the new Alter Ego Collection from Color Club! With my love of sparkle, I am particularly excited for the Darks palette. Alter Ego and Alias both appear to be duochromes. Color Club is the brand that made me love creme formula polishes. I love the subtle tints and surprises that add interest to their neutrals. 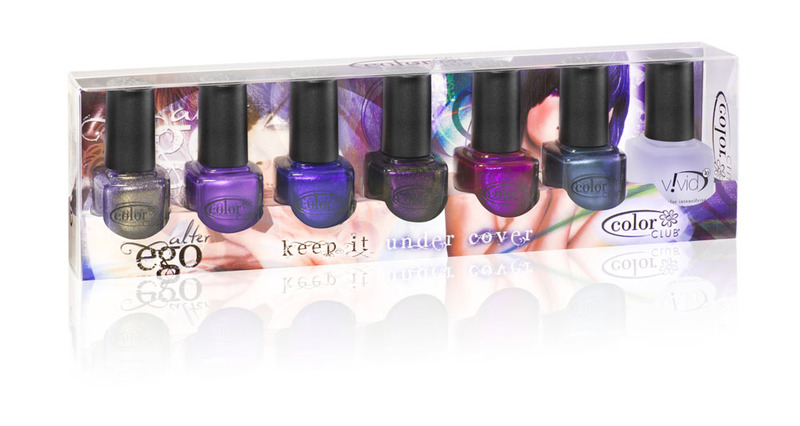 Their cremes make great base shades for nail art. I am particularly interested in Secret Rendezvous, a pastel whitened lilac. I think Give Me a Hint will be popular as a Spring taupe. I favor their pale browns that remind me of foundation. It appears that Get A Clue and Revealed will fill that quality. The pale mint shade Sheer Disguise will likely be a favorite. What colors are calling to you? You can enlarge the images to better explore the upcoming shades. Sheer Disguise, Give Me a Hint, Milky White Base Coat. Motive, Masquerading, Vivid Top Coat. sheers of Alter Ego 'LIGHTS' and 'DARKS'! plus Milky White Base Coat. Masquerading plus Vivid Top Coat. I like the dark collection. Of course I'll wait to see them swatched. Lucy: You know those will be the first shades on my nails! Can't deny the glitter! i really look forward to the darks-interesting.the orly spring looks good too.